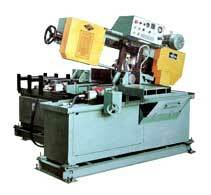 Our range of Fully Automatic Swing Type Band Saw Machine (Model FCAF-245) is torsion and vibration free. Saw Blade Size Length: 3760 mm. Width: 27 mm. Thickness: 0.9 mm. Band Speed (Infinitely Variable) 24-100 m/min. Machine Weight Net 950 kg.